Make-up artists and production designers have not always got the credit that they richly deserve. Rick Baker's work on An American Werewolf in London was deemed so outstanding that the Academy Award for Best Makeup and Hairstyling was created to recognise his work. Today's Letter of Note concerns another Oscar-winning visionary, the artist and Alien designer H. R. Giger. November 1997 saw the release of Alien Resurrection, the fourth instalment in the Alien franchise. 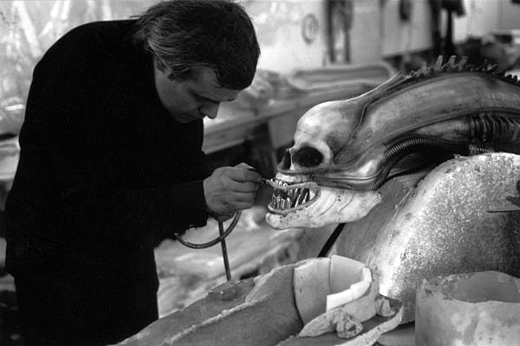 But just prior to the film's release, Giger discovered that he was not going to receive an official credit for his work. Furious at being snubbed by 20th Century Fox, he wrote an angry letter to the studio, reminding them where the creative designs for the aliens came from and praising Alien director Ridley Scott for constantly giving credit to him in interviews. The whole text of the letter can be read here, including its threatening last paragraph. You can read my reviews of the entire Alien saga (excluding the Predator crossovers) here. On a similar novel, here you can read James Cameron's letter of apology to Giger for not bringing him on board for the making of Aliens. Bottom line: never, ever mess with Giger - or if you, you better have a good apology.